Welcome to the highest point of luxury in Jacó, it's literately the top two floors of the tallest building. The quality, size and views of this Penthouse are peerless. Just a little over an hour from the International Airport, in San Jose, between 2 avowed national parks, Carara and Manuel Antonio, minutes away from a world class golf course and and marina at Los Sueños Resort, the best surf at Playa Hermosa and of course exquisite local and international cuisine. This is the place to be. 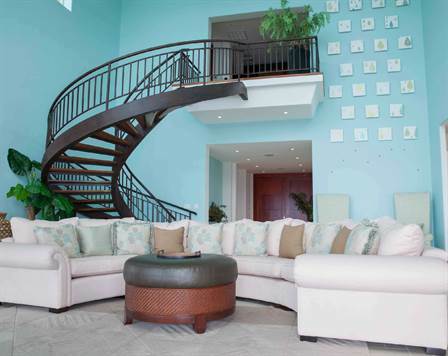 Upon entrance to you're greeted with an alluring view composed of the spiral staircase, the expansive living room and two-story high windows gazing upon the Pacific Ocean. There's a welcoming feeling of openness stretching from the high end kitchen all the way to the media room. You can access the wrap-around terrace from any point on the first floor, which lets you admire the entirety of the beach, from north to south, the mountains and most of Jacó, you can even see the rain coming from the ocean a mile away, with a view of about 230°. It's hard to choose which is more breathtaking: the sunrise or the sunset. Each one of the 4 bedrooms on the first floor has a private, luxurious bathroom, two of which are equipped with twin sized beds, ideal for the many guests who will want to visit your dream Penthouse. On the second floor there's one office and 2 identical master suites, each featuring vaulted ceilings, private master bathrooms, large windows with mountain, city and ocean views, plus 2 separate outdoor terraces, the perfect place to soak up the sun, unwind after a long day of adventures in Costa Rica or enjoy a romantic private evening. Other features included are: private access elevator key, touchscreen temperature control panels for individual room temperature control, intercoms, surround sound system in the media room, outside speakers for the terrace and 100% power backup. The high-rise itself features a stunning infinity pool, beautifully landscaped grounds, secure covered parking, assigned storage, 24/7 total security, property management and a rental program.